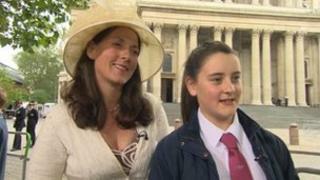 A teenager from Kent has described singing for the Queen in St Paul's Cathedral as a "thrilling experience". Josie Hawthorn, 13, from Hadlow, was part of the Diamond Choir which sang in the Diamond Jubilee Service of Thanksgiving. Josie was one of 41 young people chosen for the choir after more than 400 auditions at 18 cathedrals around the country. The choir sang an anthem composed to mark the Queen's 60-year reign. The anthem, which is called The Call of Wisdom, was written by composer Will Todd. Josie, who wants to be an opera singer, said: "It was amazing, it was such a thrilling experience and I really enjoyed it." The Diamond Choir sang The Call of Wisdom with choristers of St Paul's Cathedral Choir and the boys of the Chapel Royal during the service of thanksgiving at St Paul's Cathedral. "We got up at half six, had breakfast and then we came here at half eight and we had a little rehearsal and then we went in and did the service," said Josie. Her mother Jacqui Hawthorn said Josie's whole family was "enormously proud" of her. Mrs Hawthorn added: "It's been a truly wonderful experience for Josie and it just illustrates how music can really bring people together. "A new piece of music, 40 children from around the whole of Great Britain, working together and coming up with the sound they came up with today, it's just absolutely incredible."